Colors play a large role in the effectiveness of a company’s tabletop displays and brochure holders. In this article, I will share how the psychology of colors affects your marketing and branding, to help you design a display table or booth that people want to visit. According to research from the Color Marketing Group, “color increases brand recognition by up to 80%.” Why? Color reaches our deepest instincts and elicits our most basic emotions. Emotions, in turn, help drive decision-making. According to Dr. Liraz Margalit, the Head of Behavioral Research at Clicktale, “Visitors are more likely to add a product to their cart when the emotional process takes control, as they are directed by ‘how it feels’ and not ‘is it worth it.’” Color provokes emotions, emotions drive decisions, and decisions determine whether someone stops at your table or keeps on walking. By selecting the ideal colors for printed promotional materials for your tabletop displays stands, brochure holders, sign holders, and display table, you can improve the effectiveness of your marketing campaign. When doing so, take into account the opposite effect too: selecting the wrong colors might drive away potential customers. So, select your colors carefully. Here are some tips on how different colors provoke emotional responses and how to encourage passers-by to stop at your table and learn what your product is all about. Be careful about using too much red, though. Used in excess, it can generate anxiety and a sense of urgency, just like brake lights and fire trucks. Use it as an attention-getting accent in your trade show booth, and you’ll notice how people’s eyes tend to land on it. Place it where you want visitors to start their visual journey. When you want to tone it down, a complementary green does the job. Complementary colors are those at opposite ends of the color wheel. They tend to moderate each other’s impact tastefully. You can easily find the exact complement of your brand’s color with a color wheel, such as Adobe Color CC. Think of picking an orange from a fruit basket: juicy, flavorful, and packed with energy. Remember that orange, a combination of red and yellow, is another warm color and likewise, provokes mixed messages. The orange Home Depot “Let’s do this!” campaign branding provokes an energetic attitude that’s not out of reach of the traffic-barrel “precaution” that is so important in the construction industry. So, as with red, use a touch of orange as an attention-getter, but where you would like to elicit an action. You might add an orange arrow to a sign to encourage visitors to try out a product or sign up for a raffle. You can use orange with blue, its complement, to keep it under control. Have you noticed that both Sunkist and Fanta use blue to tame down their primarily orange soft drink branding? Another eye-catching color, yellow, provokes a vibrant, energetic sensation. In excess, however, it says, “caution.” Just like the other warm colors, it’s best used as an attention-getting accent. That might have something to do with why Post-It Notes’ canary color has become an office standard. Because it is such a powerful color, add a touch of yellow to your brochures to get attention, but use it with moderation in your display area. You can always cool down your yellow accents with a complementary blue background. The energy of yellow contrasts nicely with the calming effect of blue. Green in a brochure holder brings about a feeling of growth and health. Derived from two primary colors, a warm yellow and a cool blue, it emanates harmony. Think: Starbucks and Whole Foods Market. You can use green with a fair amount of liberty in your tabletop display stands. Warm and inviting, it’s perfect for promoting eco-friendly products or health systems. You won’t need to worry much about toning it down, but as mentioned, it does a nice job of taming orange accents. Ever notice how a day on the lake, with blue sky above and blue water below, makes for a great weekend? Trustworthy, strong, and secure, blue is a cool color that adds a sense of honesty and authority to flyers, brochures, and booth decor. Use it to invite customers to feel at ease to step up and take a free sample. Blue can also provoke a sensation of coolness, and you may try to warm it up with warm, complementary orange accents. Domino’s Pizza and CostCo have both used the power of blue successfully with red. Tabletop displays containing purple print materials can tie your display booth’s image to royal abundance, wealth, and even mystery. A combination of the warmth of red and the cool of blue, you can take advantage of purple to emphasize a creative or even eccentric element of your tabletop displays. Hallmark often uses the color with its complement, a golden yellow, for an effective, rich look toward the creativity of their products. You can use purple to get the attention of your table’s younger visitors, who are fascinated with exploring the mysteries and unknown aspects of life. Whether you’re offering games or hair accessories, the color will reach the eye of adolescents. Earthy and natural, viewers will likely perceive a predominately brown tabletop display message as solid, dependable, and reliable. Like green, it’s an excellent choice for ecologically-friendly products and services, and its honesty and neutrality make it an excellent selection for informational tabletop signs. Composed of the three primary colors, red, yellow, and blue, brown is balanced and complete. Like green, we are naturally accustomed to see it in abundance, so it works well for booth curtains or tablecloths. It provides a relatively neutral and comforting sensation without distracting from your products themselves. Powerful, elegant, formal, and mysterious, black goes well with nearly anything and works with nearly any branding style. Nothing reads more easily than black on a white background, and nothing speaks more authoritatively. It’s an excellent font color for any of your light-colored or white tabletop signs. Tabletop signs set on a black tablecloth will really stand out. Use black sparingly in the print material that you add to brochure holders and easel back displays. It can overwhelm lighter colors, but for text and defining shapes or adding shadows to images, it’s unbeatable. Opposite from black, white also goes with any of the colors. It’s neutral, safe, pure, and clean. White’s neutrality, like that of black, along with its clean appearance, make it an excellent background element for your tabletop displays. A display area dominated by white is easy to visually scan and looks organized. All of the rest of the colors come from mixtures of the above. Products and services oriented toward young women will often use pink, which is a lighter version of red, and marketers aim for their male audiences with variations of blue. Metallics, such as gold, silver, and copper, also have their place in tabletop displays as highlights and accents. Try adding handwritten details to printed tabletop signs using a metallic colored marker for a bold, personalized touch. Once you’ve established the colors you want to use for your signs and brochures, you need to find the right tabletop display stands and brochure holders. 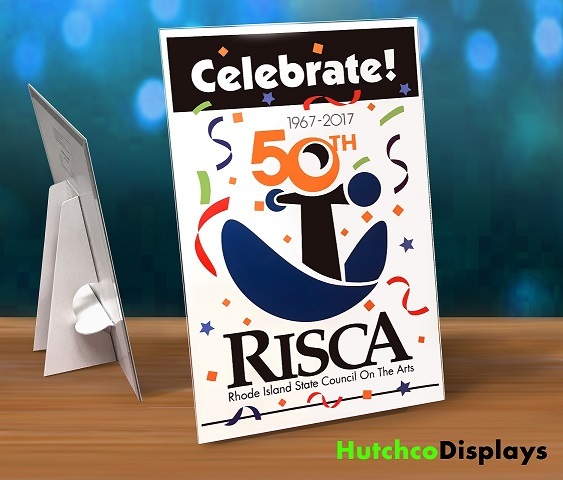 HutchCo will help you find the perfect frames and displays for your tabletop or booth. Have fun selecting your color combinations for your tabletop displays, and watch how people react to them.